This recipe for sarma is the Serbian version of stuffed cabbage that many Serbs serve every day but especially for special occasions like their slava and other holidays. Some people use imported or homemade whole heads of brined cabbage (sauerkraut) known as kiseli kupus when making their sarma. Check this quick tip for an easy way to remove leaves from a cabbage head. Note: While there are multiple steps to this recipe, this stuffed cabbage dish is broken down into workable categories to help you better plan for preparation and baking. Steam cabbage until outer leaves are limp, then remove leaves. With a paring knife, remove tough ribs from leaves without damaging them. Reserve tougher outer leaves, but don't use for rolling. In a medium bowl, mix together ground chuck, ground pork, rice, and onion soup mix. Adding a little water will make the mixture easier to handle. Heap 2 tablespoons of filling on each cabbage leaf. Fold the bottom of the cabbage leaf up over meat. Then fold sides to the center, and roll away from yourself to encase completely. Repeat until meat filling is gone. Discard the cabbage core and coarsely chop any remaining cabbage except the tough outer leaves you have reserved. Spread chopped cabbage on the bottom of a large casserole dish or Dutch oven. Add the sauerkraut. Layer on the cabbage rolls, seam side down. Cut the smoked ribs into pieces if using, otherwise, space the smoked meat of choice between the cabbage rolls. Cover rolls with reserved tough outer leaves. Mix tomato sauce and soup with enough water to make a liquidy consistency. Pour over rolls until mixture is level with rolls, but not over the top. Cover casserole dish and bake 1 hour. Then reduce temperature to 325 F and bake for 2 more hours. Let sit 20 to 30 minutes before serving. 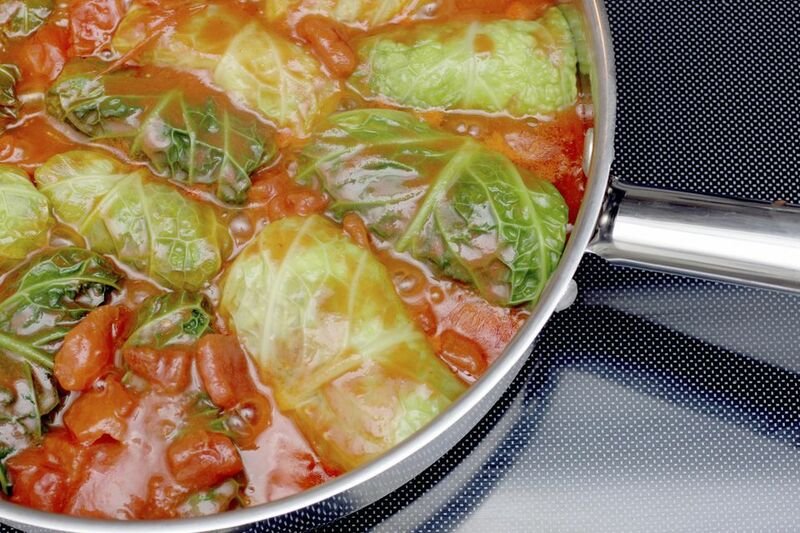 Stuffed cabbage in one form or another is present in most world cuisines but especially among Eastern Europeans. Czechs and Slovaks call them ​holubky and Poles refer to them as ​gołąbki. They all boil down to the same thing—meat and a filler like rice or barley rolled up in a cabbage leaf and cooked on the stove or in the oven.